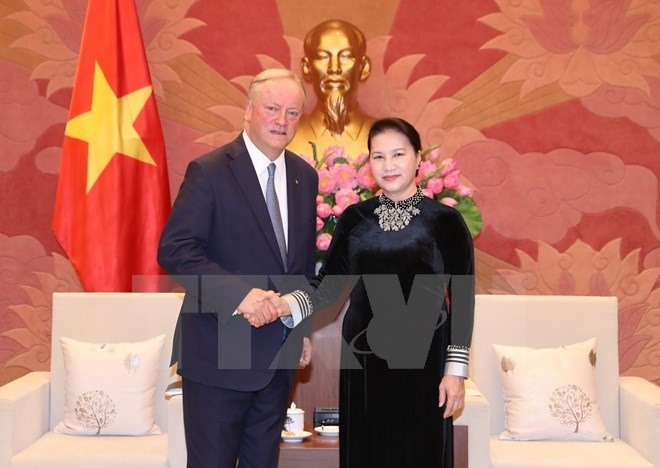 HÀ NỘI — Chairwoman of the National Assembly (NA) Nguyễn Thị Kim Ngân and Deputy Prime Minister Vương Đình Huệ received David Cruickshank, Chairman of Deloitte Global, yesterday and acknowledged the auditing company’s contribution to the Vietnamese financial sector. Cruickshank was attending the 2017 APEC CEO Summit held in Việt Nam. Deputy PM Huệ asked that the Deloitte auditing firm support Vietnamese companies to implement publicly available financial reports, making it easier for international and domestic bond issuers to gain access to these companies’ performance and financial security. Huệ noted that during the current period of international economic integration, all economic units must enhance their accountability and transparency. Reliable audit reports would help create confidence for businesses and affirm the effectiveness of state management. NA Chairwoman Ngân said she appreciates the cooperation of Deloitte Global in general and Deloitte Vietnam in particular. The company has contributed significantly to Việt Nam’s development in recent years, she said. She also expressed her desire for Deloitte Global to share their experiences and expertise with NA’s representatives to improve their understanding of the financial sector. The Deputy PM praised the high quality of work and ethical behaviour demonstrated by Deloitte Vietnam employees; while stressing that the company should focus on auditing multinational corporations, large enterprises and other listed companies in Việt Nam. Ngân proposed that the company continue to invest in Việt Nam, bringing advanced technology and international experience to provide high quality auditing services. Additionally, Huệ said he hoped that Deloitte would support the development of Vietnamese businesses by delivering public financial statements in line with international standards, issuing domestic and international bonds, and collaborating with the Ministry of Finance (MoF) in creating accounting and taxation programmes. Deputy PM Huệ said Việt Nam is a market with great potential for Deloitte as the Government continues expanding the scope of financial auditing for public service units. He said this will inevitably continue as the need to manage revenues and expenditures, especially in the healthcare sector, where several former public hospitals have been completely transformed into independent units, expands. Cruickshank commented that he was deeply impressed by Vietnamese businesses’ economic growth and global competitiveness. In the context of international economic integration, the role of the auditing sector in Việt Nam is important in helping enterprises comply with international standards, said Cruickshank. Leading a delegation of Deloitte Asia-Pacific leadership to Đà Nẵng City at the same time as the CEO Summit, Cruickshank co-hosted and moderated a roundtable discussion focused on trade, technology and globalisation. He congratulated Việt Nam on its successful organisation of the 2017 APEC Summit, and said that Deloitte would have many more opportunities to cooperate with Vietnamese enterprises in the near future, by valuing equitised firms and corporate bond issuance to improve transparency and operation support for start-ups. As the 4.0 industrial revolution continues, marking the globalisation of information technology, it is important for businesses from all economic sectors to share their experiences with one another, as Deloitte will share their knowledge in the fields of audit and capital support with Vietnamese enterprises, said Cruickshank. After 25 years of growth, Deloitte Vietnam has established a strong position as a global brand with the breadth and depth of services to meet the demands of enterprises, proving itself to be a pioneer in the Audit and Advisory field in Việt Nam.